Attach an X-ray or photograph in .jpg format with file size not exceeding 20 Mbytes. 1024 Budapest, Rózsahegy street 10. 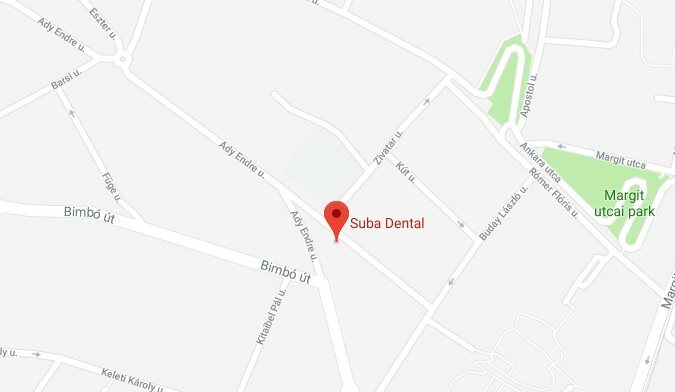 Our clinic is accessible both from Ady Endre street and Rózsahegy street. Please note that parking is subject to a parking fee on workdays between 8:30 to 18.00. BY TRAM: take tram 4, 6 or 17 and get off Mechwart liget stop. BY BUS: Take the bus 11 or 111 and get off at the Füge street stop, just after Mechwart liget stop, which is the first stop uphill. Walk back about 200 metres (220 yards) to the entrance at Ady Endre street 1. and take the elevator to the third floor to find our dental office. BY THE UNDERGROUND: take Metro line 2 (red) and get off at Batthyány tér. Change for the bus 11 or 111 and get off at Füge street. OR: take Metro line 2 (red) and get off at Széll Kálmán tér. Change here for tram 4, 6 or 17 and get off at Mechwart liget. BY THE HÉV (Suburban railway): take Suburban railway H5 up to Margit-híd, budai hídfő. Change here for tram 4 or 6 or take a walk to Mechwart liget (10 minutes).